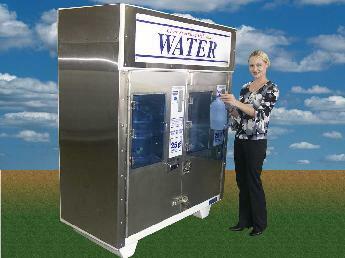 Water Vending Machines - Water Store Equipment by Aqua Products, Inc. If you are looking for a business opportunity with HIGH PROFIT MARGIN, you can't do much better than selling Drinking Water! The machines need only your WATER, ELECTRICITY & routine parts replacement to SELL your product 24 hours a day, 7days a week! Typical WATER & ELECTRICITY UTILITY RATES throughout the U.S. make YOUR COST of the product sold (drinking water) to well under a PENNY per GALLON! *Note: Profit estimate claimed above assumes that machine basis and other start-up costs are amortized over several years and that sales levels, typical at most locations, will occur. Please inquire. New Product Announcement! The WATER STATION! We now offer a totally NEW product line that combines the larger vending capacity of a commercial water store R/O system with the self-service convenience of a water vending machine! We here at Aqua Products feel that we have the BEST state-of-the-art water vending machines and systems on the market. Our hi-tech machines feature such items as John Guest fittings, which require no tools for tubing changes or parts replacement, to Brass pumps, bill-validators, all stainless steel hardware, stainless steel front and side vandal covers, to an electronic digital timer which is accurate down to 1/100 of a second. With this timer, vends from one ounce to five gallons are easily accomplished. There are many other small innovations that we have learned over the ten years in the vending business that are incorporated in Aqua Products machines. Aqua Products manufactures the BEST water vending machines! Each machine contains a complete R/O (Reverse Osmosis) treatment system and an Ultraviolet Sterilization System. Our vending machines are listed with the City of Los Angeles Electrical & Mechanical Test Labs for safety. All water vending machines are built to order. Therefore you can tailor your machine to fit YOUR needs! Do you want a machine for shipment to a foreign country? We can build it so that it works on that country's electric system! We also can insure that the coin or bill acceptor units can handle the country's currency. We even can make the machine dispense water by a remote button, operated by an attendant or business owner where no coins or currency are used. Do you want extra protection from vandalism? We can cover the cabinet with Stainless Steel. With our experience, we can solve many difficult problems, such as these. As the owner of a business, you are responsible for the quality and taste of the drinking water you supply to your customers. Aqua Products is proud to have built hundreds of R/O SYSTEMS, both large and small, to serve Retail Water Stores, Hotels, Restaurants and many businesses. Whether you need just a few hundred gallons a day to over 10,000! Aqua Products can build it for you. Just like our vending machines, each system is tailored specifically to YOUR needs. We can even build and ship our systems, ready to work practically ANYWHERE IN THE WHOLE WORLD!